Eight Irish tourism enterprises, including Ballyfin Demesne, joined Tourism Ireland in Cannes, France, for this year’s International Luxury Travel Market (ILTM). ILTM is an invitation-only event for the global luxury travel industry – which was attended this year by more than 1,450 influential travel agents and decision-makers working in the luxury travel sector, as well as leading luxury travel editors and journalists, from 73 countries across the globe. 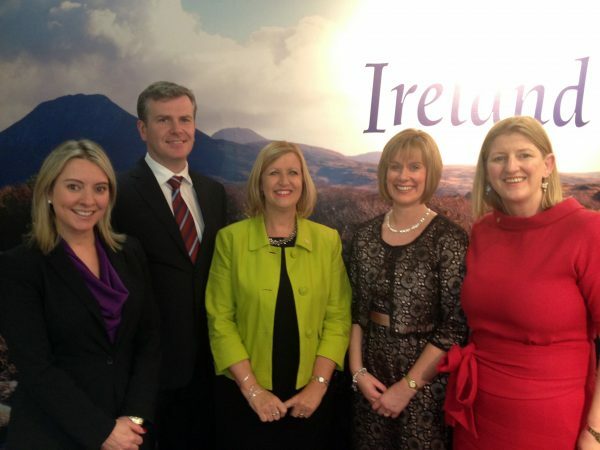 Liz Godfrey, Adare Manor Hotel & Golf Resort; Evan Butler, Mount Falcon Estate, Ballina; Joyce McElroy, Tourism Ireland; Emer Mortell, Aghadoe Heights Hotel, Killarney; and Aileesh Carew, Ballyfin Demesne, at International Luxury Travel Market in Cannes. appointments and networking sessions – providing a wonderful opportunity for Ballyfin and the other Irish tourism enterprises to meet, and do business with, the influential travel agents who design unique, luxury travel itineraries for high net-worth international clients.